I've been using an Elecraft KX3 as my main station rig for 2 years, ever since returning to ham radio after over 20 years of being QRT. I purchased it since it met my needs at the time: high performance, and; low-impact operation. Now that I've added a FT-1000MP to my shack it seems a good time to review how the rig performs, and how it meets my primary interests of DXing and contesting. The latter activity was not in consideration when I bought the KX3 since I didn't realize that I'd return to contesting. There are ample reviews of the KX3 so there is no need for me to do the same. In any case I do not have the test equipment needed to do a proper technical review. You can find those elsewhere, such as the QST review and user feedback on eHam. My intent is to give an operator's impression of the rig, both its high points and lows, as applied to DXing and contesting. My review is in some degree going to be unfair to the rig. It was not designed to primarily serve as a base station, or for the most demanding applications. Take this perspective into account as you read onward. For its intended use the KX3 is a superior product. I mean that whole-heartedly. The receiver front end is fragile. There are two significant categories of signals that overload the receiver: strong signals within the roofing filter; strong signals farther away, even very far away. This is with the optional KXFL3 roofing filter installed, which I ordered with the rig and is factory calibrated. My impression from regular use is that the roofing filter does the intended job of reducing IMD from strong adjacent signals. However when very strong signals fall within the roofing filter the rig may turn off the pre-amp. This is reasonable when that signal is from the ham who lives a couple of blocks away, but less so when the signal is from W8. There is a brief message on the display when this happens which I have rarely noticed while tuning across these signals. A minute later I'm wondering why the band is suddenly quiet. When the rig was new I was always puzzled as to why I would occasionally notice that the pre-amp was off. Eventually I discovered what was going on. The other problem is fundamental overload where a strong signal into the front-end, even if well outside the ham bands, is detected regardless of VFO tuning. This can be very inconvenient when it occurs. For example, there is a shortwave broadcaster in the US with an exceptionally strong signal here. Even with just a dipole that station can push its way through the receiver and be AM-detected no matter where the rig is tuned in the 20 and 17 meter bands. A narrow bandwidth on CW reduces the interference though not enough in many cases. Turning off the pre-amp or using the attenuator will usually cure the problem, but at the cost of sensitivity. The better your antennas the worse the overload problems since signals presented to the front-end are going to be stronger. As with all electronics the speed and capacity of DSP hardware has remarkably improved over the years. When coupled with effective software there is the potential for superior performance. In my experience the KX3 does very well in this regard. The continuously variable receiver filter bandwidth (50 Hz steps) is a delight to use. At all settings the audio signals come through very clearly. Even at the narrowest bandwidth (50 Hz) ringing is low. It is also convenient that the roofing filter automatically adjusts in response to the filter setting. There are limits to what the DSP filtering can accomplish in this direct conversion receiver. Filter skirts are shallow. For example, I typically set the filter to 200 Hz on CW and yet can hear well outside that narrow range. It is how I compromise between noise reduction (local QRN) and not missing much as I tune across the bands. During contests I often narrow the filter to 100 Hz for S & P (search and pounce) and only need to open it up to 300 Hz when calling CQ, and I don't miss much. The APF is pretty much superfluous on this rig. Multi-pole crystal IF filters are needed to get the steep skirts needed for best QRM and noise rejection. This is not only impossible in a direct conversion design these filters could not fit inside the KX3's small cabinet. A bigger issue is opposite sideband rejection for single-signal reception. This is another case where the shallow filter skirts limit performance. Elecraft is well aware of the issue but their suggested solution is one that has side effects I don't care for. So I live with it. It is a particular problem in popular CW contests where stations are packed close together. Even middling strong signals the other side of zero beat interfere with the desired signal. It can also be confusing in that a seemingly interfering signal is in fact 1 or more kHz away. I find it necessary at times to jog the VFO to determine whether the signal is really within the pass band. I have a lot of noise to contend with throughout the day when neighbours are awake. Most seems to come from LED lighting power supplies, which is added to by various appliances and computers. The worst band is 80, followed by 30, and lesser noise on 20 through 10 which varies with the yagi's direction. For some reason 40 is mostly quiet. Since I can't change the world or hope to track down every noise source and convince my neighbours to fix the problems the receiver must have effective noise control features. NB and NR are important features. The NB in the KX3 sometimes works well and sometimes makes matters worse. The NB was not adjustable until a firmware version that came out in (I believe) 2013, after I'd owned the rig for a while. Unfortunately the variability helped little so I typically keep it at or near maximum (15). The major problem with the NB is its susceptibility to signals outside the filter bandwidth and within or near the range of the roofing filter. Even if those signals are of middling strength the NB is heavily modulated and pretty much renders the desired signal unreadable. This appears to be a case of where the DSP filtering is unable to make up for the limitations of the basic receiver design. The NR sometimes works, though as with most rigs with NR it typically works best on SSB, and not so well on CW. This is especially true with weak CW signals, where the NR is of no benefit. In my experience adjusting the NR doesn't help on CW. When the noise is making a CW QSO difficult I often try the NB first. In the majority of cases I get a better result by tightening up the filter to 50 or 100 Hz. In contests where most of my QSOs are S & P (search and pounce) I use a narrow filter of 100 to 200 Hz to contend with the noise and QRM while ensuring I miss few signals as I tune across the band. Every rig associates a variety of controls with each VFO-band pairing, though not always the same ones. On balance I feel that the KX3 does better at this than some other rigs I've used. For example, the KX3 remembers these important settings with the VFO-band pair: attenuator, pre-amp, NB, NR, mode, frequency, and perhaps some others. Since noise and signal levels are band and antenna dependent the first four of those are very welcome. Other rigs often don't associate these with the VFO-band pair, requiring some button pushing on every band change. What I wish the KX3 would remember is the filter bandwidth. It associates this setting with the mode but not the VFO-band pair. Yet like the items mentioned above the filter is also a control I set differently per band, for reasons of noise and activity level. At least that's how I operate. These features work pretty well aside from the small size of the controls. The problem I have is one of tuning rate. It can take many turns of the knob to effect the desired offset. The VFO rate is less of a concern to me than RIT and XIT. When I am scanning the band, either in a contest or in daily operation, the VFO tuning rate is fine. For larger frequency excursions it is too slow. Tuning rate can be sped up with a long press of a button, but then the steps are quite large and unsuitable for tuning in a station. Alternative rate settings in the menu are less than ideal to my style of operating. It's easier to use the rig control pane of logging software for large QSY steps. RIT and XIT tune so slowly that they are very cumbersome for use in split operation. It is almost always better to use both VFOs for split and leave the RIT and XIT for minor adjustments on ordinary QSOs. The QSK (CW break in) and VOX (SSB) work very well. I have heard some complaints about the rig's QSK though that is the opposite of my experience. I use it full time on CW, and I use CW for over 95% of my QSOs. At well over 30 wpm I can hear clearly between dots. There are no annoying switching transients. When I decided to enter a SSB contest last year I had planned to use PTT with a foot switch, just as I did years ago. I ran into some difficulty wiring in a foot switch and time was pressing, so I decided to try VOX. It worked so well that now I only use VOX when operating SSB with this rig. It was easy to adjust, reasonably immune to inadvertent or extraneous sound, and never cut enough of the first syllable to cause copy errors at the other end in rapid-fire contest exchanges. I did not purchase the optional ATU (automatic tuner). This could have been added later if I got tired of manually adjusting an external tuner. But once I transitioned from my eaves trough antenna to resonant outdoor antennas I found that tuning was not necessary. At 10 watts output I rarely triggered the protection circuitry even when the SWR got as high as 4. The only serious problem I encountered was common mode from my eaves trough antenna that was easily cured with a coax choke. It similarly was happy putting out 5 watts on 160 meters when feeding the coax centre pin of my 80 meters half sloper. In this case the measured SWR was close to 5. The KX3 is really small and lightweight. This makes it an ideal portable rig, it's designed purpose. As a base station -- how I any many others use it -- size is a problem. When I describe the rig to others I like to say that I can cover the entire face plate with one hand. It's no exaggeration. The majority of controls are on one of the main circuit boards, which is mounted directly underneath the face plate. When you press a button you are pressing on the circuit board. Although the physical support for the board is quite good I worry that it is prone to eventual failure. If a button breaks or the board cracks the repair implication can be dire. Further, even with my relatively light touch (I'm not physically abusive with my rigs!) the entire rig will slide backward. The rubber feet don't help since the KX3 is very light. Another problem with its small size is the overlaying of features on the available controls. In addition to a primary use each button or knob can access (presumably less-used) features by long press, pushing knobs, or by pressing another button first. While necessary in a compact design it does cause operating grief. For example, I have several times managed to QRM a DXpedition when trying to operate split since the A=B key is also a split selector on a long press. Playing back a CW memory requires 2 button pushes making it almost useless due to the delay involved between action and result, and the potential for error. For some reason the normal CW mode operates on the lower sideband (LSB). This is opposite to most other rigs, requiring that I set the mode to CW-R (reverse, or USB) to suit my operating style. In N1MM Logger+ I had to locate the option to use CW-R rather than the default CW mode, otherwise every clicked (self-)spot reverses my preferred mode. It's a solvable problem though not one I find convenient. As originally designed the microphone gain could not be set to accommodate a dynamic microphone element. For some reason Elecraft was reluctant to change this despite numerous requests. I was surprised since, as it turned out, it was correctable with firmware alone. To their credit they did relent and I was able to use my venerable Heil headset with the KX3. Despite the company's protestations about noise and hum that can come with high gain I have experienced no such problem. Ultimately I am happy with the outcome and the KX3's flexibility in regard to the variety of mic elements and handheld controls they support. After adjusting the gain and ALC in accord with the manual I also added compression for more SSB talk power. The feature itself is standard on every rig on the market although not always done well. From numerous solicited requests on the air I feel confident in saying that when properly adjusted the KX3 produces a high quality, easily-copied SSB signal. This is with the Heil element that emphasizes the mid-range; I set the KX3's mic equalization to flat. This was trivially easy: just plug one end of the supplied cable to the rig and the other to a USB port. When I first purchased the KX3 not all popular software supported it since it was relatively new, a lack that has since been filled. I have no issues with any of the standard and contest logging software. At least not since setting communication speed to its highest setting of 38,400 bps. Otherwise the logging software was slow to track mode and frequency changes. One thing I particularly like is that only the one interface is needed for contesting since it can be used to send CW and play rig-resident message memories. That is, no additional serial port is needed for PC-generated CW. However when used in this way there are some things to be kept in mind. closes off one QSO and invites others to call. The KX3's KY command converts the following text to CW, delimited by the ';'. CW speed is determined by the setting on the KX3. ESC can't be used to interrupt transmission. You must tap the paddles. CQ auto-repeat interval is from when the command is sent to the KX3, not from end of the transmission. It is best to disable this feature and press F1 as needed. Sending speed cannot be easily adjusted from the software. For example, the "<" and ">" speed change commands don't work, nor do the PageUp and PageDown keys. If you operate SO2R or switch rigs the CATAASC macros must be swapped out. I have this problem now that I have a FT-1000MP, as soon as I start using it in a contest. I consider this a small inconvenience, well worth the benefit of interface simplicity. At least for now. There are other things I like and don't like about the KX3, though those are relatively minor items that I won't spend time writing up. Features I don't use I can't report on at all, including everything related to digital modes and battery operation. I plan to continue using the KX3 for contests in the coming months. Although I have the FT-1000MP it requires some work to be ready for the demanding requirements for contesting (CW filter and various mods), and I do not want to risk neighbourhood RFI. That is, my contesting will remain QRP. Every rig has its problems, including the KX3, so the negative points I've made should be kept in context. There is also the matter of personal preference, where my preferences can be very different from that of others. The KX3 is well regarded in the ham community, a reputation it deserves. Be sure it meets your needs if you are thinking of getting one. I really enjoyed reading your comments. So many people think the KX3 is a perfect radio and it's not. I own one and love. I'd purchase another so I could keep one in the shack and take the other portable but that's just plain crazy. 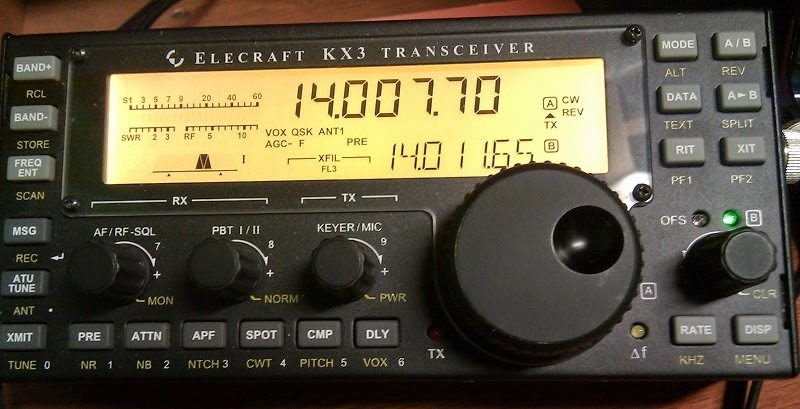 For a QRP radio that is completely self contained, the KX3 is the only way to go. I was given a set of Elecraft paddles that attach to the KX3, I did not like them. They kept skipping a beat. I cleaned them numerous time and could not resolve the problem. I then purchase the Palm Pico paddles with the KX3 adaptor. They are just great. One the KX3 I noticed a noise when I tuned across the 17 meter band. It's like a whine when turning the VFO. I had to go into the menu and there is a menu item that addresses this. I turned it on and 90% of the problem went away. I have to admit they need a much better speaker. It is terrible but usable. I am fine with it when I'm using CW but for SSB it is really bad. It is easy to add a PTT jack. Use an off the shelf stereo splitter. Getting to 0% Error Rate: "Not In Log"